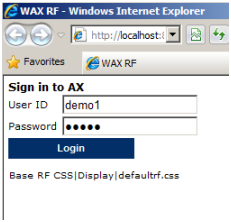 The first step in using the RF is to setup a user ID for those that will be using the RF. This can be accomplished by using the work user form. 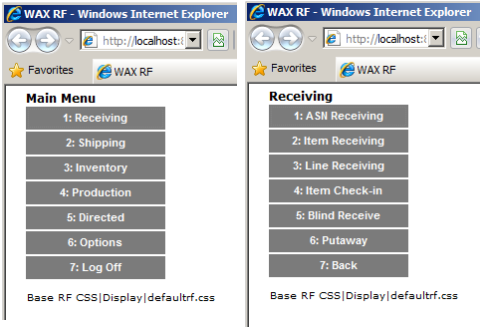 Here you can define which RF menu the user will use. Different menus can be different screens for different users. You can also define groups, for different rules for different users. From the RF Menu item form, you can setup the different menus that will be displayed on the RF device. There are many configurable options here. The mode decides either to use existing work to execute or others will create work from the RF. Generate License plates: The system will create a license plate number for certain transactions. Useful for purchase orders. Default Data: When this is checked, you can specify what you want the system to display for the user. For example, you can display the “from location” when a certain menu is always used to pick product from the same location. Activity Code: Is only used for indirect mode types. Gives you the ability to log off, change warehouses, inquire on a location, inquire on a license plate, and to start a production order. There are several more options that can be configured as well. Location inquiry: When users are on the floor, they will need quick access to look up information. For this option, the user would need to scan the location. The display would show all products, quantities, and location. License Plate Inquiry: A user can use this to see how much product is on a license plate or pallet. It shows the location of the license plate and quantity. 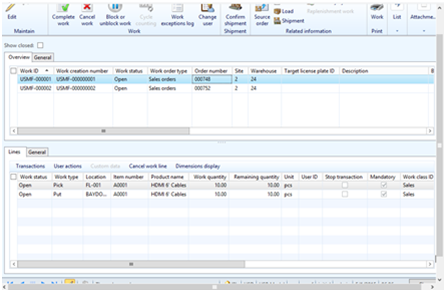 Item Inquiry: With this option, a user can scan a specific item to find out where it exists in the warehouse. The display would show all locations and quantities for that item. Adjust In/ adjust Out: Users have the ability to adjust out or in quantities to fix inventory within the warehouse. Quarantine: When inventory needs a status change, using the quarantine menu option is the best and fastest way to do this. Useful for items that might be broken, missing, or need to be looked at. You can customize these names and add different statuses. Reprint Label: This option allows the user to reprint any previously printed license plate label. To display RF menu items within the menu, you will need to use the RF Menu form. From here you can add different titles and options to the menus. For the shipping manager, you can simply drag options from the “available items” to the menu structure and it will show up on RF device for any user given access to the menu item called “shipping Mngr”. 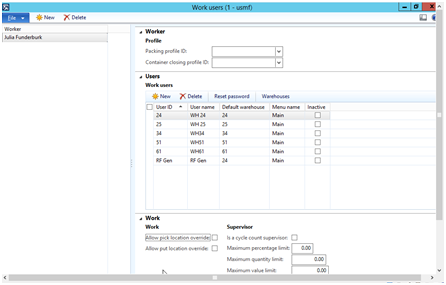 The work user sessions form allows access to see who is logged into the RF. From here you can end sessions for users and check for error messages if they occur. To end a user session, click the “kill session “button. The user then logs back on and will see the menu from the beginning, not where they left off. Clicking on “Log” will display an info log of a message if there has been an error. Multiple methodologies are supported. Regardless of the method, WHM automatically registers the receipts against the purchase order details, and prepares the purchase order for final posting of the receipt packing list. 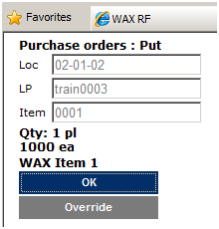 In some cases, WHM allows automation of the packing list as well. WHM replaces the need to print the receipts list, and also removes the need for arrival journals to be posted against the PO. The following example shows a typical receipt of product, where a single operator is going to identify the goods, and then also put them away. The user signs on with a user id and password. These are AX users, but also have an additional configuration in WHM that controls some functions. The first step is signing onto the RF Device, and then navigating to the receiving menu. The user then selects the type of receiving. For this example, “Item Receiving” is leveraged. The menu items are user definable. The user can scan or enter the item number they are receiving. Standard AX item cross reference is leveraged, and the entry is validated against the PO details. If not on the PO, the user will be warned. Based on the item entered, the RF unit populates unit of measure (UOM) dropdown box. This allows the user to enter the quantity in the unit of measure desired. Regardless of the entry, WAX will convert to the highest entity possible. The unit of measure can also be leveraged by location directives and work templates, covered in detail in other sections. A key concept in WHM, and in general best practice warehousing is the concept of a license plate. It is no different than a license plate for a car, in that it uniquely identifies and tracks the owner, the address (current warehouse bin location), and other key demographics (item, qty, batch, etc.). One of the many advantages of a license plate, is that it allows that entity (a pallet in this example) to be moved, transacted against, etc. independently. Once a license plate is established, it can be leveraged in any process in WHM. To finalize the putaway, the user confirms the putaway by pressing the ok button. In the example pictured, the user is not required to verify additional information. WHM supports several additional verifications. See the picking strategies section as well as location setup for other verification options. Once this process is executed, the product is on hand, and is available for picking and shipping. The quantity is registered to the appropriate purchase order detail. 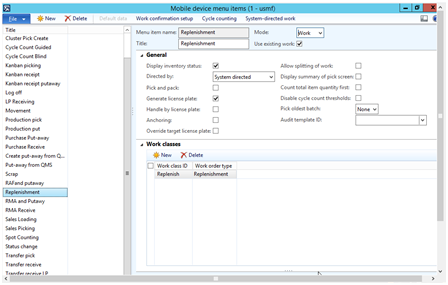 Inventory is removed from the user location and placed on hand in the destination location. Once all of the purchase order has been received, it is ready for standard posting in AX. This is accomplished through the base AX posting à Packing Slip from the purchase order itself.